In today’s conventional carbonization lines, the oxidation process is assumed to consume the most energy, take up the largest footprint, and is the largest capital investment. Alternative production processes to conventional oxidation, such as “plasma,” and alternative precursors to traditional PAN-based precursor, are seen as the best path to the achieving lower cost carbon fiber, and have been receiving the most attention. Recent technology innovations from Despatch, however, can now offer a viable and readily-available technology extension that can meaningfully lower the cost of producing carbon fiber. Keys to reducing the oxidation process cycle time from a typical sixty to ninety minute cycle are low process variability, effective and controllable heat transfer rates, and increased zones of control. Previously, trade-offs in ease of maintenance or capital equipment costs have made integration of these factors cost-prohibitive, limiting potential cycle time reduction. Despatch’s next generation Split-Zone™ Oxidation Oven with Novariance™ Technology will allow manufacturers to aggressively push the oxidation rate to reduce oxidation cycle time, and lower the cost of oxidized fiber. By creating two discrete thermal profiles for the upper and lower half of the chamber, temperature in the upper half of the oven can be increased by several degrees, advancing the rate of oxidation of the fiber within the same process chamber. Novariance™ Technology with patent-pending orifice-plate nozzle structures eliminate the side-to-side and directional variance inherent in conventional nozzle designs. 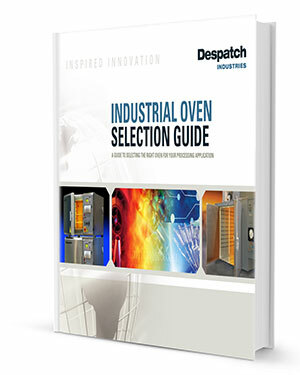 Despatch will be showcasing Split-Zone Oxidation oven at its Lakeville facility in the 4th Quarter, 2015. An animated video is available on the Despatch website for those interested in learning more, visit www.despatch.com/oxidation.